Pryde’s Point – Meadows, woods, streams and old ruins! Pryde’s Point has two parking lots, I parked at the one on Rocktown-Lambertville road in West Amwell. Link to hike map and more trail information. I find the greatest connection to the world around me when I am knee deep in it. I also find the greatest connection to other people when we are walking and talking. This morning I met up with my good friend and college roommate for a hike through Pryde’s Point. There is something so freeing about being able to walk through nature and talk through what is going on in our lives. When the talk might stray to a place that is not ready to be talked about, a butterfly or a bird may streak across the view and pull you out of that conversation. The depth of the forest also allows for deep thoughts and feelings to arise and be expressed in a way that can’t happen in closed rooms. I love going on walks with people, it is in my experience, the best way to get to know someone. Or in this case, to catch up with a friend I haven’t seen in a while. Common Teasel, Dipsacus fullonum, an invasive brought to the United States from Europe to be used in textiles. Now iI am not great at identifying meadow forbs so I asked another friend with some identification help. I absolutely love playing highway botany (my husband points out plants for me to ID while we are on a road trip) and getting text messages from friends and family of different plant photos or questions. It is such a fun distraction and I love to nerd out learning and figuring out new-to-me plants. An Eastern Tiger Swallowtail, Papilio glaucus. This is a very common (and beautiful!!!!) butterfly in New Jersey. The host plants for this butterfly in its larval stage are Black Cherry, Prunus serotina, and Tulip Tree, Liriodendron tulipifera. Read more about the Eastern Tiger Swallowtail here! Watch out Vampires!! Blue Vervain, Verbena hastata, a native flower with a whole lot of folk lore attached to it! In case you have a vampire problem, apparently Vervain can weaken or even kill a vampire 😉 . Vervain is also great for butterflies, so instead of planting Butterfly bush, plant vervain instead! Attract butterflies and get rid of vampires, what more could you ask for in a plant??? Blackberry, Rubus allegheniensis! How lovely it is to stroll and snack on these tasty aggregate drupes! Yum! A Monarch Butterfly, Danaus plexippus, probably the most famous and recognizably butterfly around! I want to set up a tank and raise some at home for my wild boys to watch them grow. My 3 year old already informed me that “caterpillars turn into chrysalises and then turn into butterflies” in his adorable dialect that turns “L”s into “W”s. Whenever we find inch worms or caterpillars he always asks me what they will turn into, and frankly I don’t have a very good answer for him most of the time. I think I need to find some sort of ID book that will have moths and butterflies in their larval stage. Jewel Weed (Touch-me-not), Impatiens capensis, flower. I know I talked about these flowers in an earlier post, but just look how stunning it is! It is so tiny and can get hidden very easily, but I think it is just a spectacular little flower! Bittersweet Nightshade, Solanum dulcamara, an invasive that was introduced from Europe. This beautiful flower harbors a poisonous berry that is toxic to humans and livestock. Apparently, you will have to eat more than just a couple berries to feel its effects, but children (who probably are more likely to put random berries in their mouths) are more sensitive to the toxin, solanine. This might look like I took a picture of spit… but its not, well sort of! This is actually from a spittle bug (Cercopidae Family). There are over 20,000 different species of spittle bug, but I personally have never seen an individual bug! The spittle bug makes a secretion and then fills it with air and essentially forms a mass around itself to hide from predators as well as protect itself from temperature extremes and desiccation (drying out). I always love pointing these out to people because they look so gross, but are actually super cool. Read more about spittle bugs here! Porcelain Berry, Ampelopsis brevipedunculata, an invasive that has some of the most gorgeous berries I have ever seen. When grape (Vitis spp.) leaves are young they can be confused with Porcelain berry leaves, but once they are in fruit, you will know for sure which is which. I know its invasive but those berries are so beautiful its hard to believe that they are real! Read more about Porcelain berry here! Goldenrod Bunch Gall! This goldenrod (Solidago canadensis) had an egg laid on its terminal end by a midge (Rhopalomyia solidaginis), which caused the stem to stop growing, but the leaves continued to grow. Apparently there are about 50 different types of galls formed on Goldenrod species!!! My mind is totally blown and you should read more about it here! I don’t know if this is considered a “round gall” or an “elliptical gall”. Perhaps there are two gall makers battling out for the same stem space? Dogbane, Apocynum cannabinum, and its leaf beetle, Chrysochus auratus. This beetle not only is amazing to look at (you can even see a reflection of me taking a photo of the beetle on its shell!!! ), it can do the moon walk! The sap of dogbane is thick and sticky and often causes other insect herbivores to have their mouth parts stick together, but this little beetle does a moonwalk and drags its mouthparts along the leaf to clean off the offending substance. Read more about it here! I was thoroughly confused to see all these Hostas growing in the woods. As my hiking companion said “There must not be any deer here!”. My hostas are constantly assailed by the neighborhood deer and rabbits, but these lovelies were growing to their fullest potential, blooms and all! There is a little cottage just outside of this photo frame, so they were probably planted intentionally. I couldn’t find any information on this cottage or who lived here. I didn’t notice any signage about what this place was prior to it becoming a park. There was a little cottage right above this photo, but it did not look to be very old. These ruins were right by the stream and my guess probably flooded often. I wonder what this was used for. Life always tries to find a way! This is an American Beech, Fagus grandifolia, doing its best and shooting out epicormic branches trying to survive. Pecans, Carya illinoinensis!!! One of the few true native edible nuts to the United States! While New Jersey is not in the Native Range for pecans they do happily grow here. I will definitely be coming back here in November to look for pecans! I think it would be fabulous to make a pecan pie from NJ pecans! Elks Preserve is located on Crusher Road in Hopewell. Click here for hike description and trail maps. Off he goes! We arrived at Elk’s preserve and while I was still unbuckling my littlest from his carseat, my older son took off through the woods. We have never been to this preserve before and he could not contain himself and had to be the first one out in the woods exploring. The land of Elks Preserve was farmed until 1973 and was purchased by Friends of Hopewell Valley Open Spaces (FoHVOS) in 2002. I am not going to lie, I was overflowing with pride as my three year old was pointing out and identifying different plants for my father. He was so excited to share his knowledge that he was stopping us every couple of yards to tell us about something that he saw. I am pretty sure this is Eastern Hay-scented Fern, Dennstaedtia punctilobula. I really love ferns and I need to get on the ball with identifying them. Like most plants, the best time to differentiate between species is when the fern is in the reproductive stage. Hay-scented gets its name because when you walk through a patch of it, it will smell like newly mowed grass. Sensitive Fern, Onoclea sensibilis! The spores of sensitive fern are formed in the summer but are not released until the following spring. White Avens, Geum canadense. I received some identification help from the trusty Sourland Stewards with this one! Whenever I go out on a hike I try to snap photos of plants I don’t know, and this one was new to me! White Avens is a native flower in the rose family and is good at attracting butterflies as well as being a nectar source for bees! My big dude can’t read yet, but he got so excited and shouted “Eggs!” when he saw this sign. I love informational signage on trails, they make great teaching spots and when they have photos it can help encourage kids to look for specific plants and animals. We didn’t see any eggs, but we did see a green frog! Arrowwood Viburnum, Viburnum dentatum, a native shrub that is deer resistant and great for pollinators. They have showy white flowers in the spring and have blue/black berries that are eaten by birds. This is an excellent choice if you want to add some shrubbery to your property! Ribbet Ribbet! A wood frog, Rana sylvatica. These frogs are one of the frog species that the Sourland Conservancy in conjunction with Mercer County Parks, work to protect during their breeding season. In the early spring, these frogs migrate to vernal pools to breed, which can be treacherous when that involves crossing busy (or even not so busy!) roads! Can I get a round of applause for babies in tie-dye and suspenders? White Oak, Quercus alba, seedlings. There are some tell-tale signs that this is a deer managed forest, and this is one of them! Tree seedlings! White tailed deer think these young trees are tasty treats, leaving the understory of forests bare except for a few unpalatable (and often invasive) species. These seedlings are the future of the forest and it is critical to keep white tailed deer populations in check in order to ensure a healthy forest community for our children and future generations. Look at all these young Tulip popular, Liriodendron tulipfera, trees! As you can see in this picture, most of the understory is about the same height. This can be an indicator for how long this forest has been managed. Littlest hitching a ride on PopPop and my big dude running down the path. The fallen trees are Eastern Red Cedar, Juniperus virginiana. Eastern Red Cedar is a pioneer species that needs full sun. As forest succession occurs and other tree species establish and grow taller than the Eastern Red Cedar and shading them out. Stopping for a quick snack of Wineberries, Rubus phoenicolasius. Thinking big thoughts in the forest. Stemonitis chocolate brown slime mold! When I saw this, I knew it was some sort of fungus but had no clue what it was. After spending some time googling around the internet, my mind is blown! This stuff is so funky and wild looking. I found this great article that goes into more detail and has great photos. Also, take some time to watch this video of the Chocolate brown slime mold forming sporangia! Sporangia (singular form: sporangium) are the reproductive structures formed by fungi and some plants (example: ferns) that produce and store spores. Throwing leaves in the stream, a past-time enjoyed by those of all ages. A vernal pool created by a fallen down tree. Vernal pools are critical habitat for many amphibians in the Sourland Mountain region, such as the spotted salamander (Ambystoma maculatum) and many frog species. These pools are important for breeding adults because they do not sustain fish populations which are major predators for salamander and frog eggs. Vernal pools are seasonal, and they tend to be full in the early spring and partially or fully dry out during the summer. This pool is relatively deep and it had recently rained so that may be part of the reason that it still has water. Ribbet! A green frog, Rana clamitans melanota, hanging out in the vernal pool! This entry was posted in Uncategorized on July 17, 2018 by Carolyn. The Watershed Institute – One location with many (many!) things to do! The Watershed Institute is located on Titus Mill Road in Pennington, NJ. Link to the Watershed Institute’s Website. Anyways, I digress. The point being, I had planned to get up early with the wild boys to take them to the Watershed Institute to explore before it got too hot out, but they slept in until 9:30am!! It was obscene really… They usually never sleep that late, but of course because I wanted to get out of the house early they wouldn’t get up at a convenient time. Digression again, so lets get started on our albeit short outside adventure at the Watershed Institute! We have been to the Watershed Institute a couple of times, but we had never adventured out on the trails. It was a scorcher of a day, so we tried to make quick work of the raised trail. Littlest is starting to walk and this raised trail was easy for him to walk on and was a fun perspective to look out on the meadow. Big Dude wanted none of our slow walking nonsense! Littlest modeling our Sourland Conservancy hat that can be purchased here! The Wild Boys causing a ruckus as per usual! Echinacea or cone flower, Echinacea purpurea, one of my favorite summer flowers. These flowers are just stunning and whenever I see them I just have to stop and gaze for awhile. When I was a child my mother used to make herbal tinctures from Echinacea to boost our immune systems when we had a cold. Broad Leaf Cat tail, Typha latifolia, another favorite from my childhood. 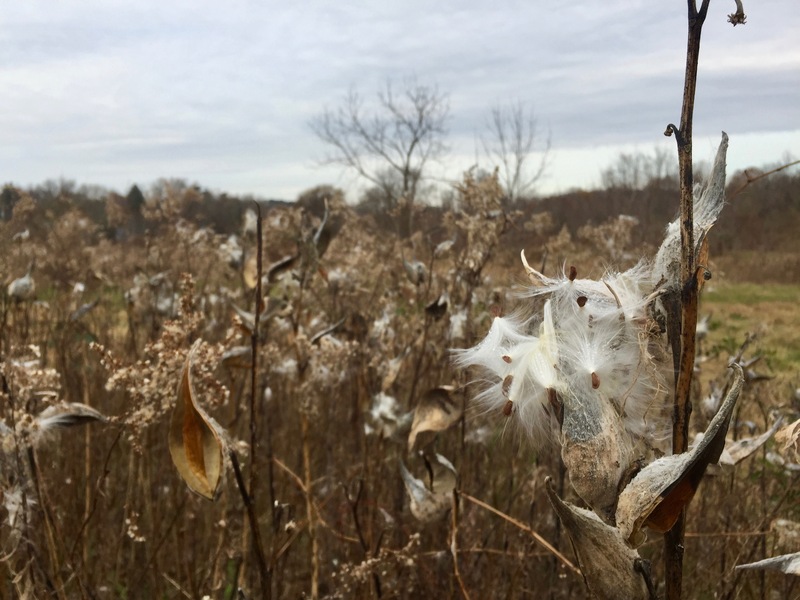 I spent part of my childhood in a small town in Virginia, and I remember going to the park and picking cat tails and pulling all the seeds out and watching them drift slowly away in the air. A bumble bee, Bombus spp., on butterfly weed, Asclepias tuberosa. First off, lets just appreciate the awesomeness of this flower? I love the intensity of the orange! Bumble bees are important pollinators and one species of bumble bee native to NJ just got placed on the endangered species list. Read more about the Rusty Patched Bumble Bee here. Dogbane, Apocynum cannabinum, a native commonly found in full sun. This plant contains the same toxic elements, cardiac glycosides, as milkweed and has a similar milky substance within its stems. Milkweed, Asclepias syriaca, in bloom! Important for pollination and as a food source for caterpillars. Queen Anne’s Lace or Wild Carrot, Daucus carota. Wild carrot and the cultivated carrot that you eat at home belong to the same species, Daucus carota, but the cultivated species we eat is part of a sub-species, Daucus carota sativus. Escaping the heat to see the exhibits inside! My big dude loves snakes! Future scientist honing his microscopy skills. Whoo Whoo made that sound? Littlest loved pushing the buttons and lifting the flaps. I mean, who wouldn’t??? I loved all the sensory exploration the Watershed Institute had for the children. Sourland Conservancy represented at the Watershed Institute! Blazing Star, Liastris spicata, a beautiful native loved by many a pollinator and person a like! Dawn Red Wood, Metasequoia glyptostroboides, a deciduous conifer. While this tree is non-native, it is not considered to be invasive. There are only a few other deciduous conifers that live in this area; Eastern Larch, Larix laricina and Bald Cypress, Taxodium distichum.